I have a multifunction printer that has a SMB-capable scanning unit. I want to have the printer send scans to an SMB share on my iMac running macOS High Sierra (10.13). drwxrwxr-x+  4 jstarek      wheel    136 16 Dez 16:41 .
drwxrwxrwt  10 root         wheel    340 16 Dez 16:15 .. I would like to have the permissions on those incoming files to include r for the wheel group. This is easy to do on Linux file systems using ACLs, and I guess one could alter the umask, too... but I'm looking for a targeted way to effectively change the umask for just this directory. Since the sender is a embedded server in the printer, I can not change anything in the configuration of the sending side. Well, macos support acl's too. 1) I'm not understanding this list too well. Why does SCAN_000275.pdf show up owned by scanaccount? The user seems to be jstarek. I'd expect ., .DS_STORE, and SCAN_000275.pdf all to be owned by the same user. 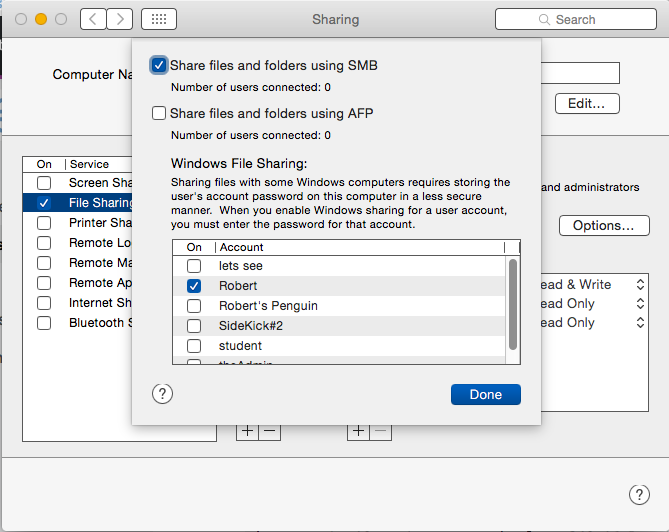 2) Shouldn't you be able to configure SMB to give permissions to let the user access the share? Isn't this what is done via system preferences via share? I'd thought this would have worked. 3) My understanding is that group wheel is some privileged group. I wouldn't expect that on a normal user. I wouldn't be giving wheel any more privileges. I wouldn't be putting group wheel on an id when you are concerned about security. Is this an admin user? Why? Not the answer you're looking for? Browse other questions tagged permission filesystem smb acl . Is there a best / OSX-specific way to force all files created in a directory to have certain group ownership?